EXTRA COLOURS: If you want a bespoke RAL colour you have to state this in the comments field when ordering and we will contact you for details. This usually takes up to 20 working days and is a an extra 10% on the net price. What is the purpose of the Double Decked Cash and Carry Trolley? The Double Decked Cash and Carry Trolley provides the best of both worlds to a retail customer. The upper platform of this pull along trolley can be utilised for smaller supplies, up to 80 kg. The lower platform can haul up to 500 kg of total weight. The 2 platforms are covered in an anti-slip waterproof plywood board. The handle allows for the trolley to be pushed or pulled with great ease. There are 4 cushioned wheels that resist punctures. Two of the tyres are swivel and ensure the unit can be moved about with ease. The other 2 tyres can be fixed with a brake for quick unloading. 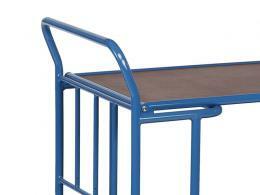 This heavy duty platform trolley is available in the colour blue. 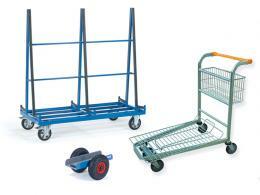 This hand trolley will be utilised best in retail or warehouse settings. 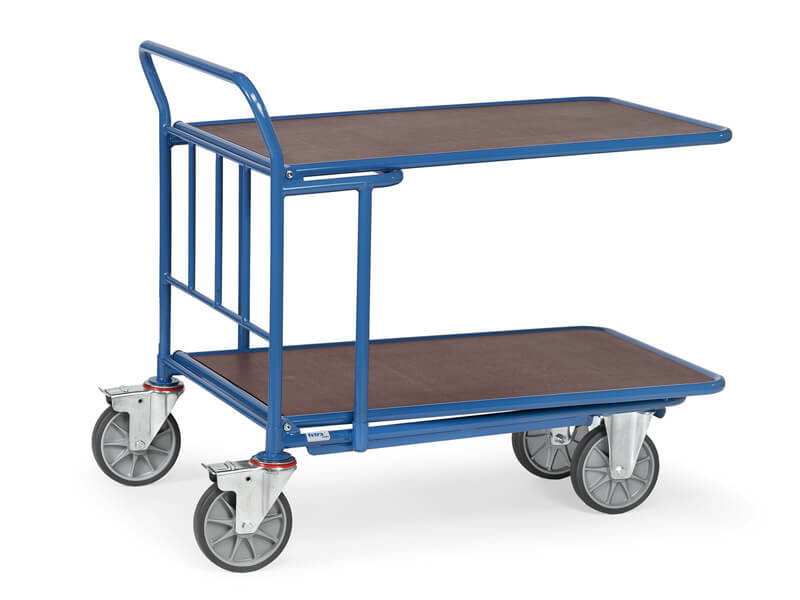 Retail customers can use this trolley cart for both heavy and light loads. Fragile items can be placed on the top shelf to ensure against breakage. The bottom platform is great for heavy loads, like cans or wood. Warehouse employees can use the trolley to separate packages for deliveries or use for a place for materials for projects. Retail customers will love this design of site trolley because the product allows for items to be separated. No worries on fragile items being mixed with heavy and bulky items. The trolley is resistant against the weather, like rain or snow. 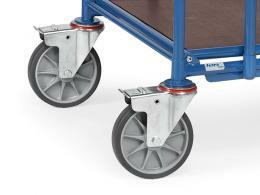 Customers can easily unload the trolley with the brake engaged on the tyres. Employees at a sorting facility will like the option of having different levels for different tasks or packages. The trolley is made with high quality materials and is very durable in normal retail or work situations, making it a versatile site trolley.